I’m continuing on my journey to write about every quarterly edition of Field Notes that I have, with a few exceptions. Last time, I wrote about Cold Horizon, and I’m choosing Shelterwood next, which was the next seasonal edition right after Cold Horizon. As usual, I’ll talk about the major “first” features in Shelterwood, with my own opinions mixed in, and end with a list of specifications and links. Shelterwood came out in spring of 2014, and was the 22nd release of the Field Notes quarterly edition series. It was a very popular edition, and if I remember correctly, it sold out within just a few months. At the time, Field Notes said it was one of the fastest selling editions ever, along with Raven’s Wing and Night Sky. They must have been pretty confident that Shelterwood would do well, because they also made Cherry Graph, a very close cousin of Shelterwood, at the same time and introduced it later as a standard, open-ended edition. I received Shelterwood as part of my COLORS subscription. 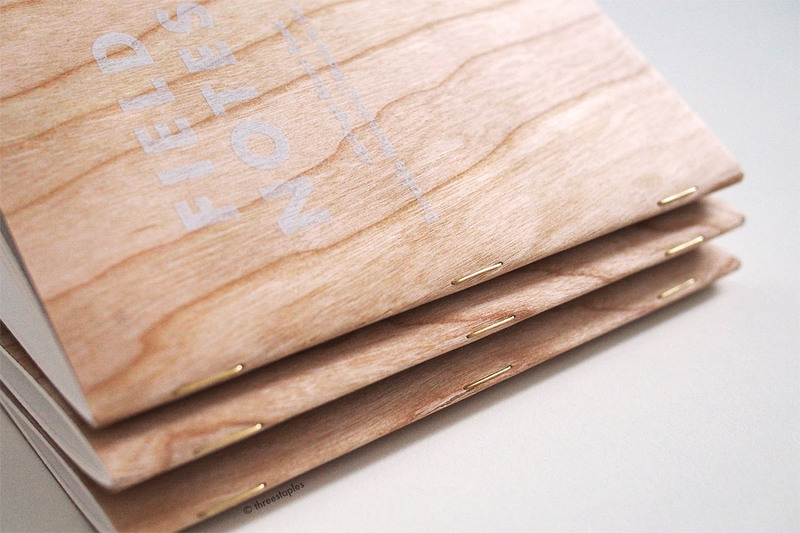 I agree with many Field Notes fans: Shelterwood is a solid edition. 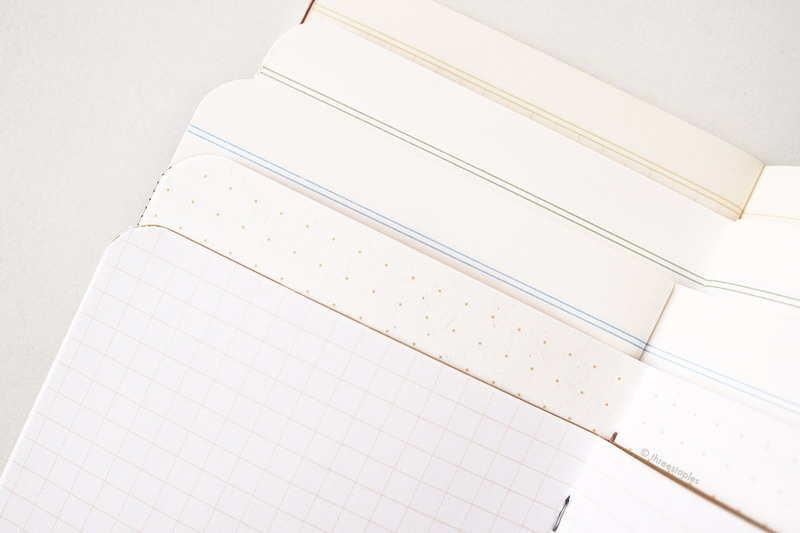 It’s visually simple but has enough special features – like thick, off-white interior paper, ruling in soft green lines, gold staples, and real wood cover – that make it a very beautiful, tactile edition. 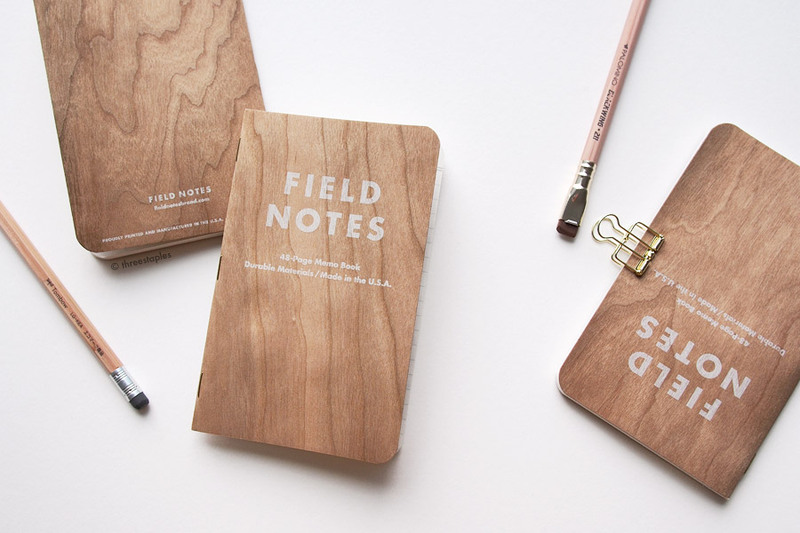 The wood cover makes me want to keep touching it, and, along with Cherry Graph, Shelterwood has become one of the “easier” options whenever I want to choose the next Field Notes to use. Each book features a unique pattern. The cover in Shelterwood tends to curl open more than other editions. It can be a bit annoying at times but Field Notes has never laid flat for me anyway (open or closed). The “Ghost Flower” white ink on the uncoated cover can look barely there at certain angles..
.. and more visible at others. I really like how this ink looks like it’s just sitting on the surface. 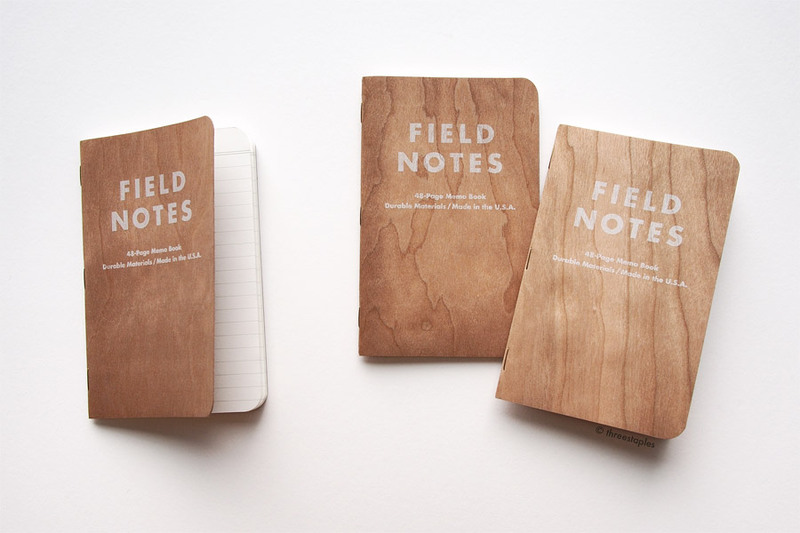 Shelterwood was the first Field Notes COLORS edition, and the only one so far, to have a real wood cover. American Cherry wood from Northern Illinois and Southern Wisconsin, to be more specific. Their Shelterwood page and film (a must watch) describe this much better than I can but basically, the wood is very thinly sliced into sheets and then bonded to brown kraft paper (you can see the kraft paper on the inside cover). I remember seeing stationery companies using thin sheets of wood for some time before Shelterwood came out, in the form of postcards and greeting cards, for example, so I wasn’t terribly surprised or impressed when Shelterwood was first announced. But I was amazed Field Notes was able to make the cover so pliable and durable. 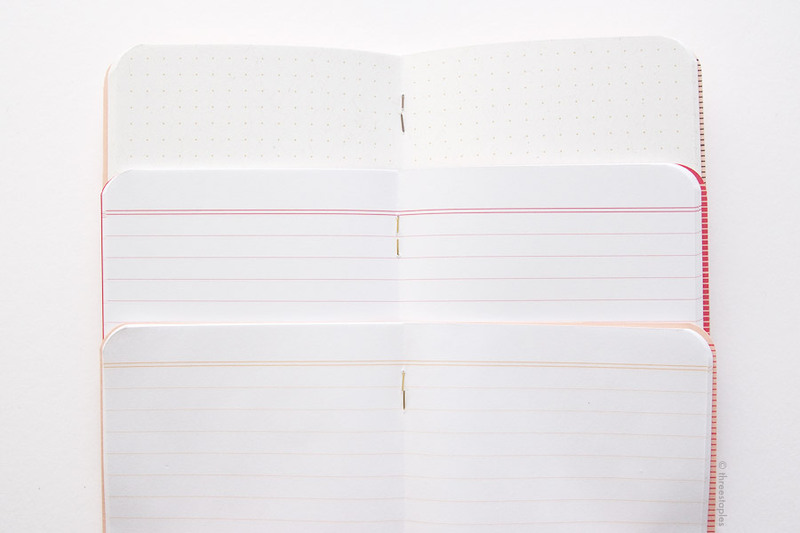 Field Notes said they were the first notebook company to manufacture such a product at a large scale. Whether that’s true or not, the result is still noteworthy. At first I was afraid the wood grain would splinter or chip off at the edges over time, but I haven’t had any issues (I’m pretty gentle with my notebooks in general though). Some books came with some tiny bits of wood missing on the spine but it hasn’t gotten any worse with use. Bryan Bedell (of Field Notes) mentioned that he carried Shelterwood in his back pocket for a few months in order to test the durability of the cover (listen to the excellent Erasable Podcast episode #28, at about 57 minutes in). The 70#T body paper in Shelterwood feels great, too. Although it’s not a requirement for me, I appreciate the thicker weight for versatility (for both gel pens and fountain pens), and I really enjoy writing on it, especially with the off-white color and muted green ruled lines. By the way, Shelterwood is the 3rd Colors edition to get the 70#T paper, after Traveling Salesman from Fall 2012 (Mohawk Via Smooth), and America the Beautiful one year before Shelterwood. Shelterwood actually uses the same paper stock used in America the Beautiful: Finch Paper Fine in “Soft White”. That makes Shelterwood the second in the Colors series to get off-white innards. Black Ice, from winter 2016, also uses Finch Paper Fine 70# but in “Bright White” color. A quick off-white innards comparison, from top: Ambition, Shelterwood, America the Beautiful, Workshop Companion, and Original Graph. Other features in Shelterwood that are not “firsts” in the quarterly editions but still noteworthy: gold staples and 1/4” ruled lines. Drink Local (Fall 2013) was the first edition with gold staples, and America the Beautiful (again!) was the first to get ruled lines, making Shelterwood 2nd. I think the gold staples were a great (perhaps an obvious) choice for Shelterwood, since they complement the warmth of the wood cover so well. As for the ruling, I don’t mind it at all. I use graph grid a lot but there are times when I miss writing in ruled notebooks, and Shelterwood has been a good option at such times. 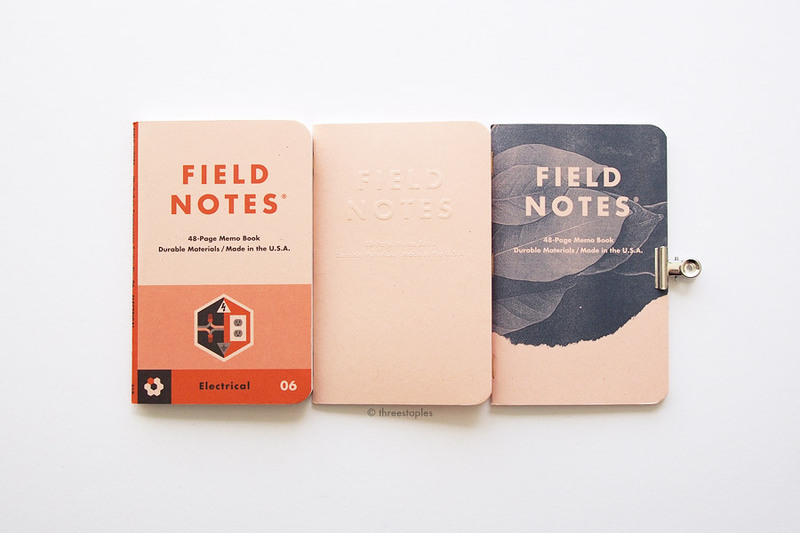 Some Field Notes with ruled lines (clockwise from top right): Black Ice, Shelterwood, America the Beautiful, Arts & Sciences (the Arts book), and Original Ruled. The green on the belly band matches the green ruling on the innards. It goes really well with the wood color in my opinion. Considering the interior paper, it might be easy to group Shelterwood together with America the Beautiful. But to me they have vastly different personalities, and that is in no doubt due to Shelterwood’s real wood cover. I really enjoy its texture, how the grain shows through the white ink, and how each cover has a unique pattern. But it’s not just the fact that it’s made out of wood that impresses me. Field Notes decided to keep the overall design simple and classy, with just a few accents, and it has great innards to boot. Shelterwood is one of those editions that I can’t help but like (and appreciate) more and more over the years. It’s not one of my top 10 favorites, not because there are things I dislike about it but because there are so many editions that I’m more drawn to. Just like America the Beautiful, I suspect Shelterwood will fluctuate constantly in that difficult range between #11 and #20 in my Field Notes ranking. Some Field Notes with gold staples (from top): Drink Local, Shelterwood, Cherry Graph, Ambition, and Capsule (SS 2016). Love how the mossy green “Twilight Sage” ink looks almost soft gray on the kraft paper. Shelterwood is the 2014 spring edition of COLORS, the 22nd in the series. Edition size: 25,000 packs, or 75,000 books, March 2014. Cold Horizon, the previous edition, was 20,000 packs. Teaser image in “A Note to Colors Subscribers” email: a photo of a Northern Wisconsin sunset. Field Notes with wood: Starbucks Roastery Edition (with birch) on the left, Cherry Graph and Shelterwood on the right, both with cherry wood. The Shenandoah belly band on the top also features birch veneer. What are your thoughts on Shelterwood? I may have squirreled away a few packs for backup but I take comfort in knowing that Cherry Graph is available and in stock.